Are you hungry to hit the open road? Take your hotel with you by choosing an RV. Recreational vehicles are smart investments for the frequent traveler. Instead of spending a small fortune on hotels, apartments and homes you can bring your lodging with you. Does that sound fun? As with any sizable investment you won’t want to rush into buying an RV. People who run into problems generally make an impulse buy instead of patiently doing their homework. Look for quality vehicles, a reputable dealer or seller and don’t buy the first RV you check out. Give yourself some time to figure out exactly what you need before selecting your vehicle. Use these tips for picking the right RV for you. Get intimate with the wide variety of RV types on the road today. Folding camping trailers, travel trailers, truck campers, fifth-wheel travel trailers sport utility RV rides and motor homes are but a few homes on wheels. Fifth wheel trailers are safe, spacious vehicles which may be a match for the avid traveler who wants to live a freeing, fun lifestyle on the road. Before investing your hard-earned money on a recreational vehicle figure out exactly what you and your family needs. Get clear on your likes and dislikes. Think about factors like your budget, if you want a truck camper or towable trailer or if you want to haul toys. Figure out your requirements. You’ll be buying a different style of RV depending on if you want it for a couple versus for a family with children. Also remember that you’ll be buying for your pets too. Think through your plan diligently because you don’t want to spend money on a vehicle that doesn’t work for you. Since many RV drivers love doing the camping bit you’ll want to keep a few key considerations in mind. Where will you be camping? Will you be doing the long haul or short haul bit? If you’re doing cross country trips pick an RV that can handle plenty of roadwork with no problems. 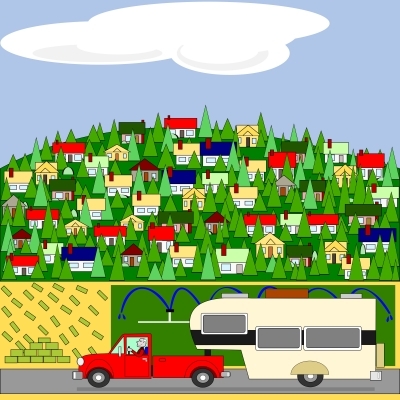 Envision how your RV would fit in certain campgrounds. Make sure the national parks you visit can accommodate your RV. Truck campers are the way to go if you want to do the back country thing. Some RV types offer packages like all terrain tires and raised axles. These additions can be invaluable if you want to off road it on your way to your favorite campgrounds. Figure out if your RV will be used for summer or year-round use. Beach bums who want to laze in their vehicle home may not have to give much consideration to the elements – other than having good air conditioning – but if you’re doing the cold weather thing avoid any trailers with pop outs or any folding camping trailers. These vehicles get way too cold during winter months. If you want to haul your ATVs, boats or other toys consider Cyclone toy haulers.